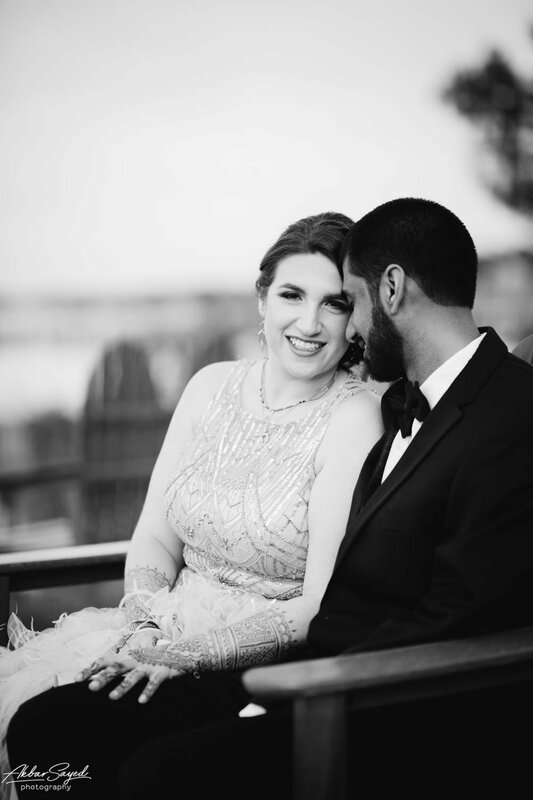 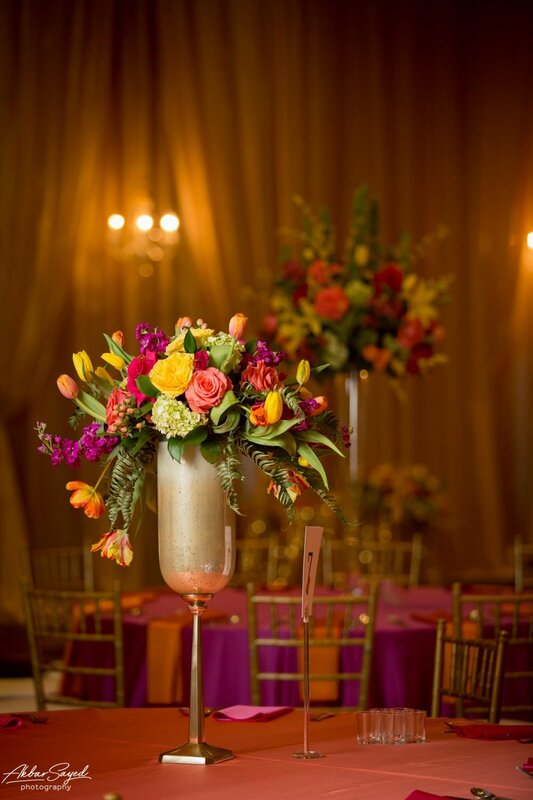 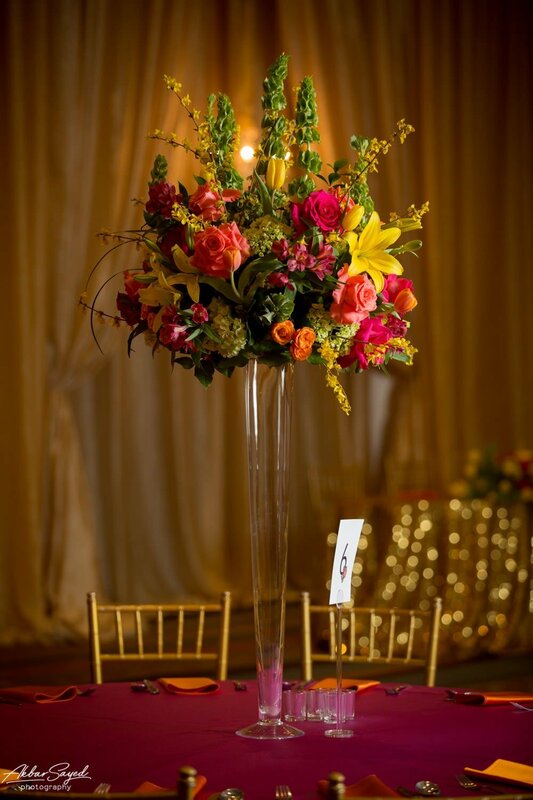 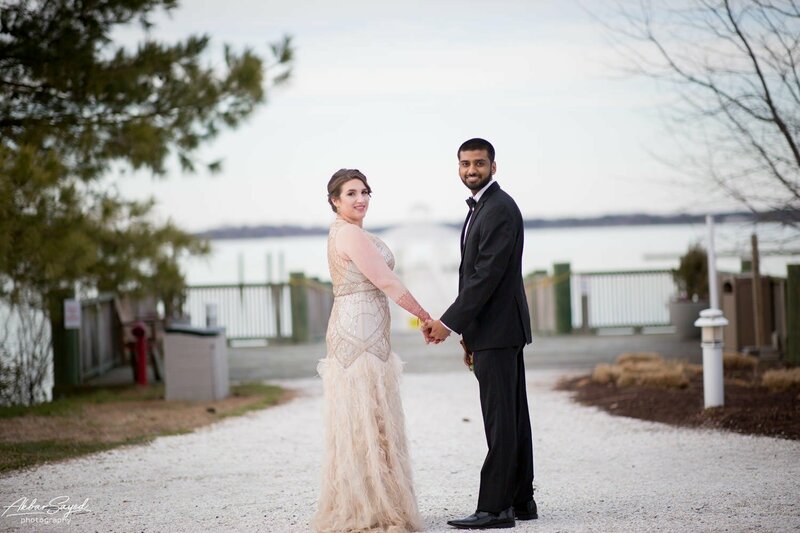 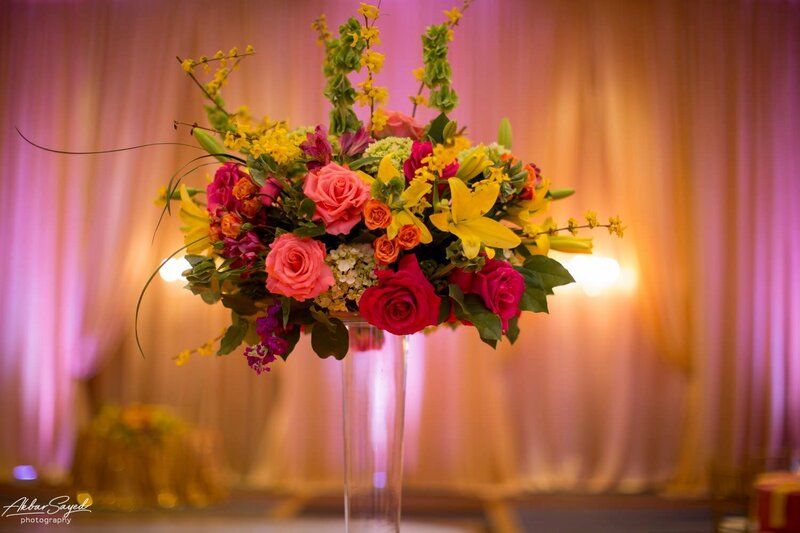 Both Cassie and Kishan got ready at the Hyatt Chesapeake Bay in Cambridge, Maryland. 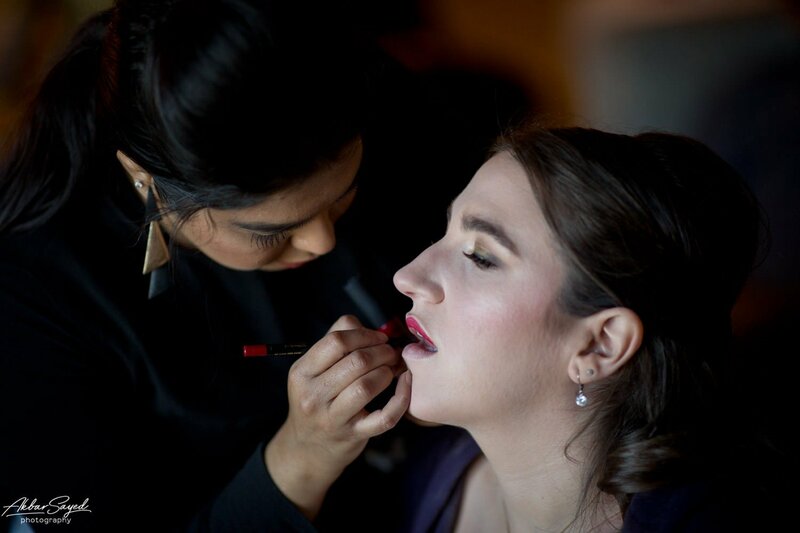 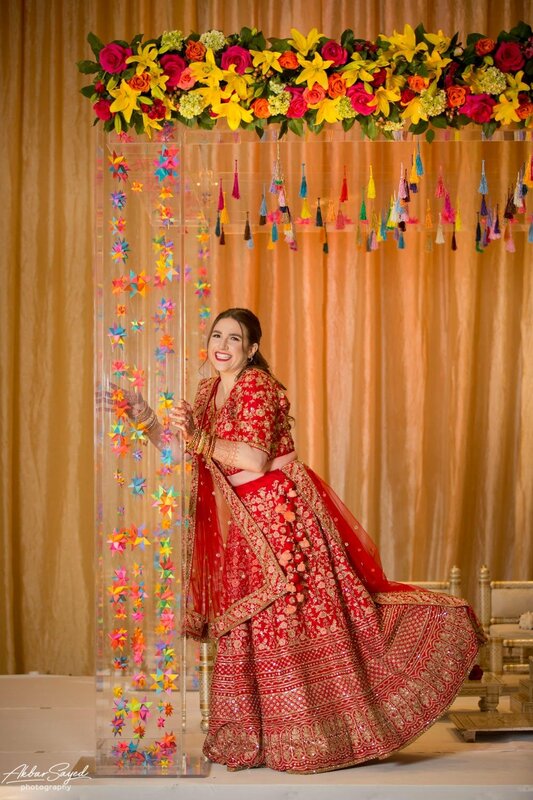 Cassie had her makeup, hair and duppatta set by Anjali Godhasara. 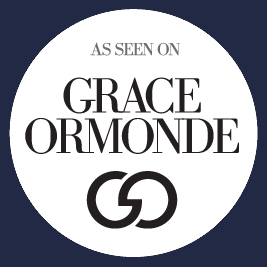 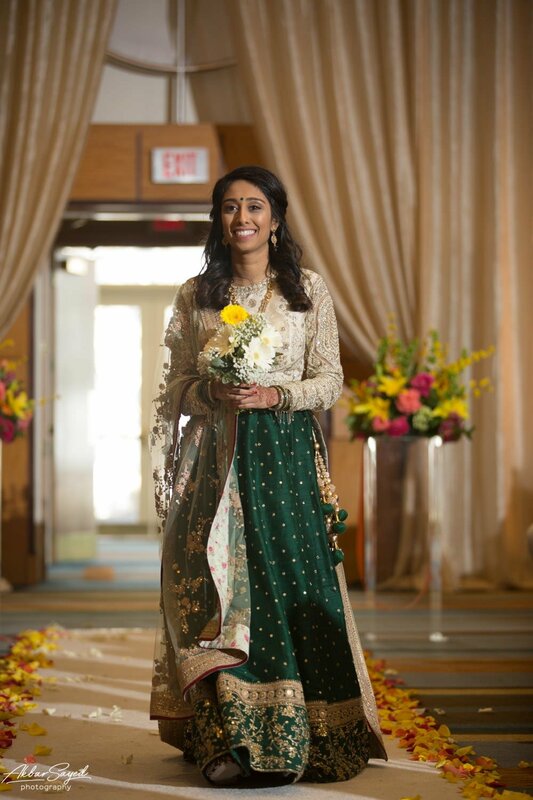 Her ceremony dress was made in India and her reception dress was made by Sue Wong. 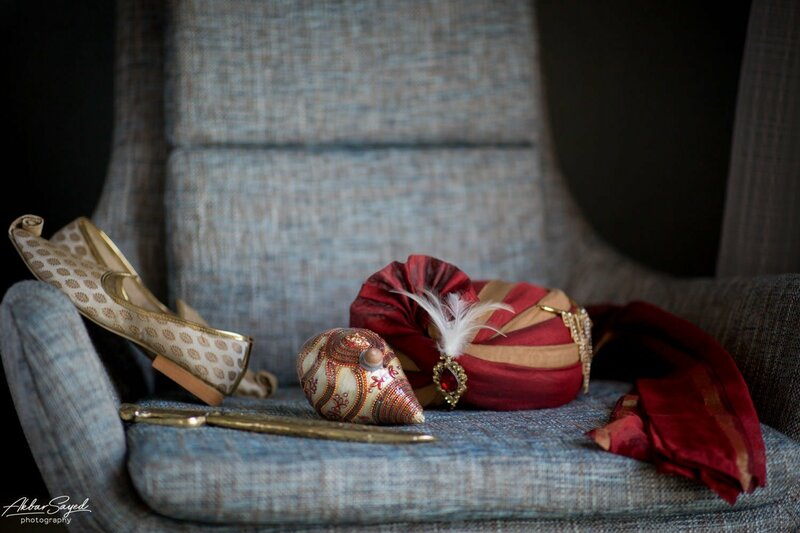 One of my favorite things about Cassie’s details was her shoes. 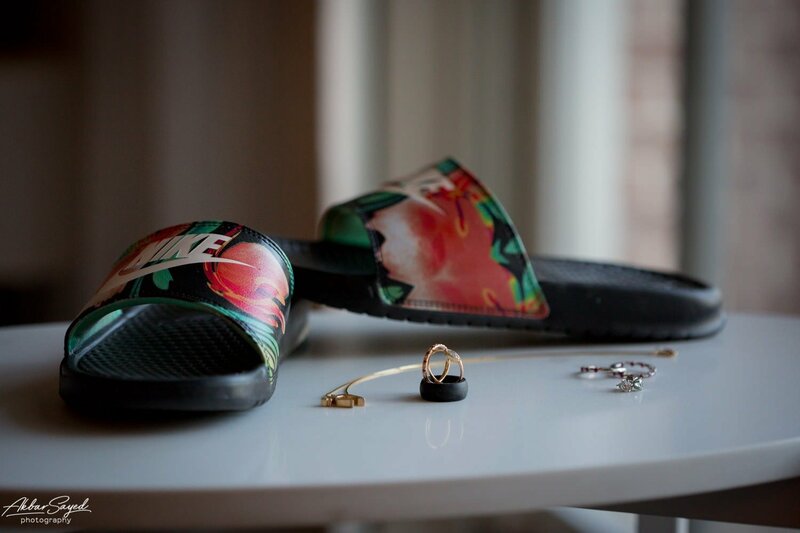 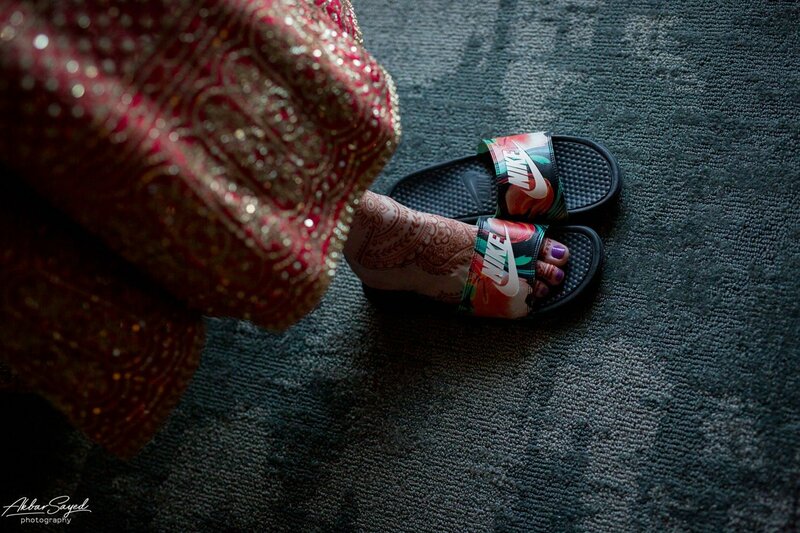 She wore Nike flip flops! 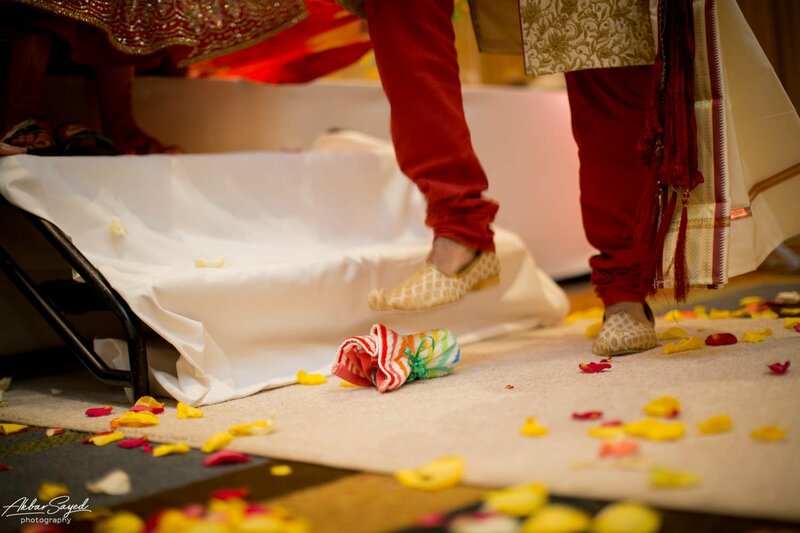 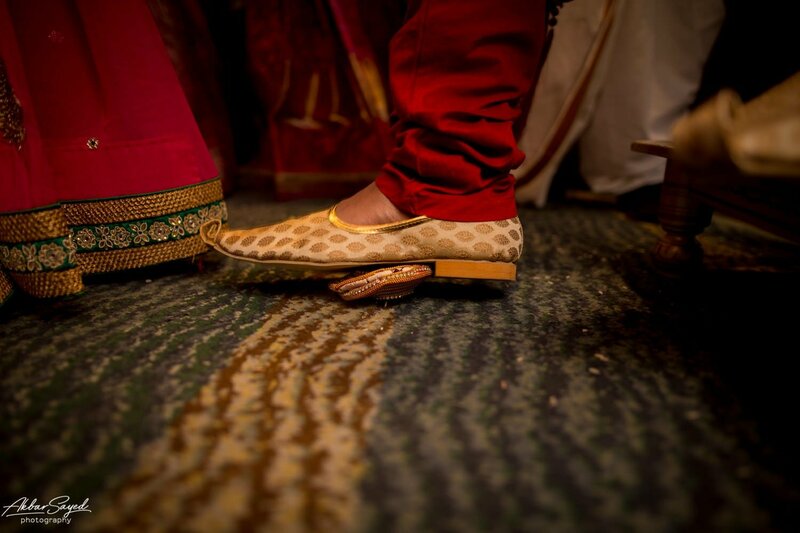 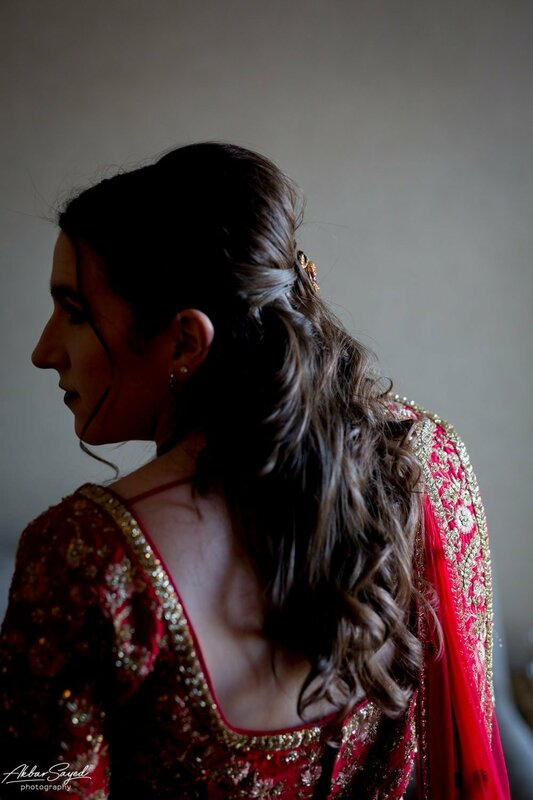 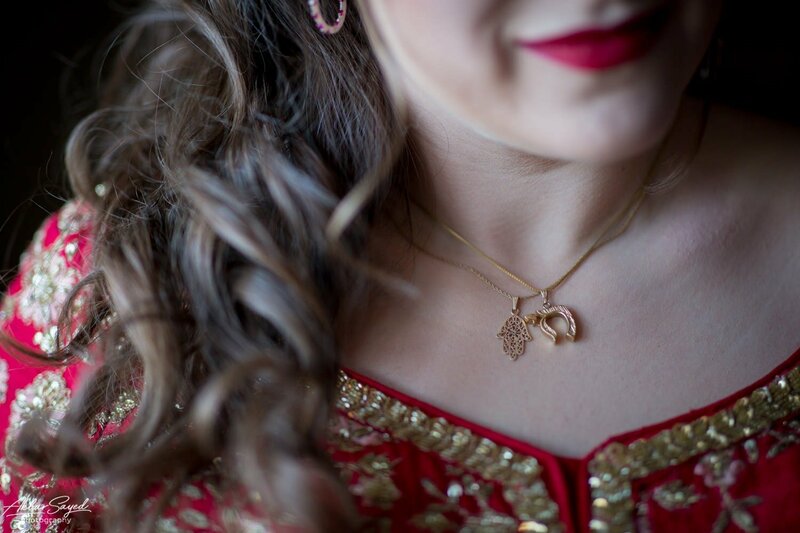 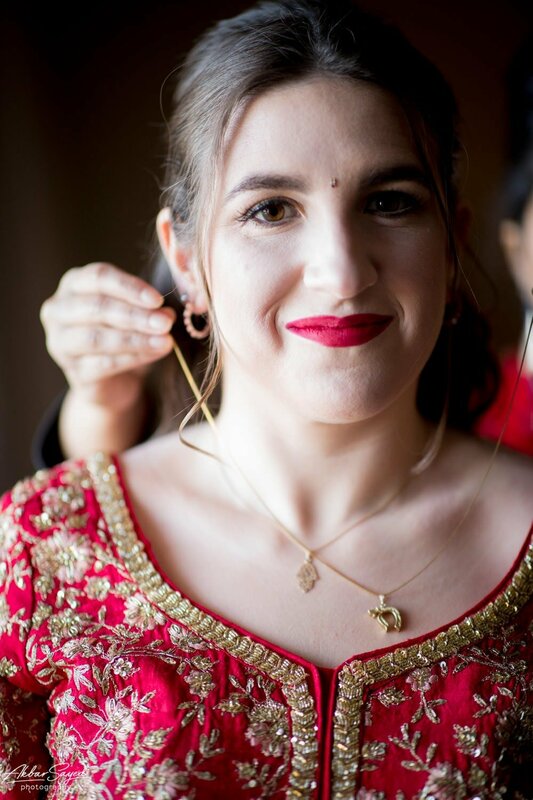 I loved how authentic she was – she was going to be taking them off at the Mandap and no one was going to see them otherwise, so why not be comfortable!? 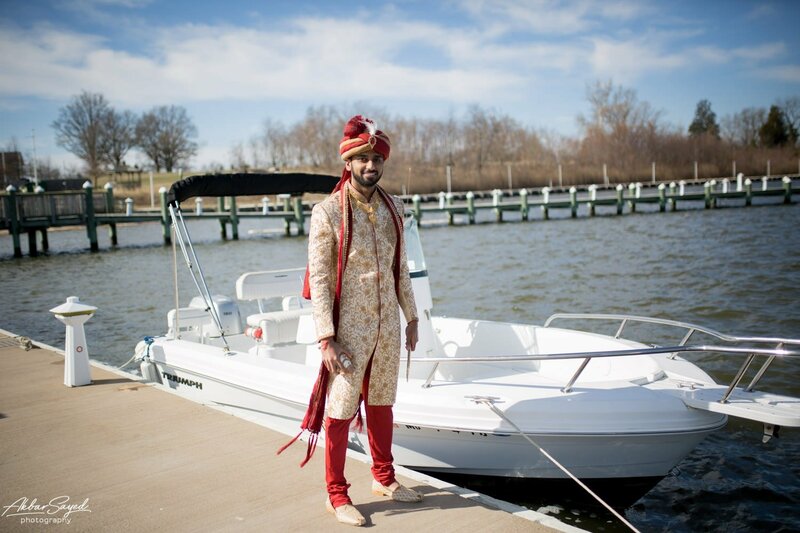 Kishan was alone for the most part while getting ready. 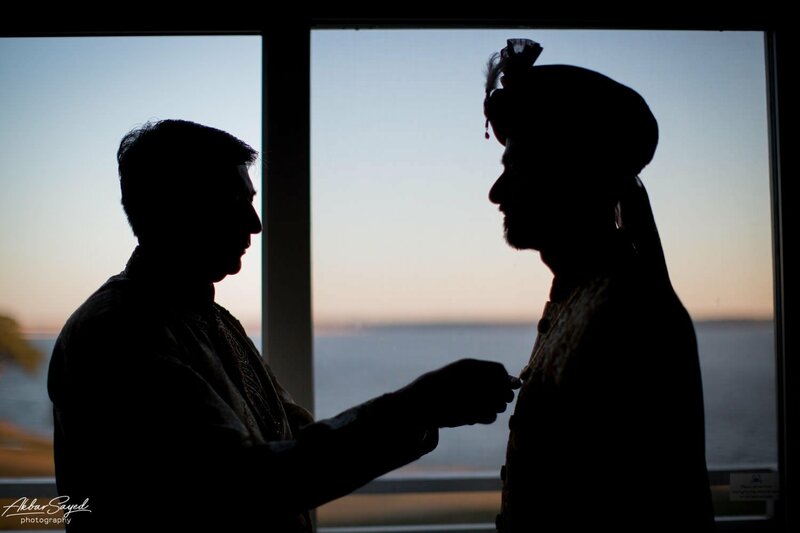 His parents joined him for a couple of moments when his father helped him with his jewelry. 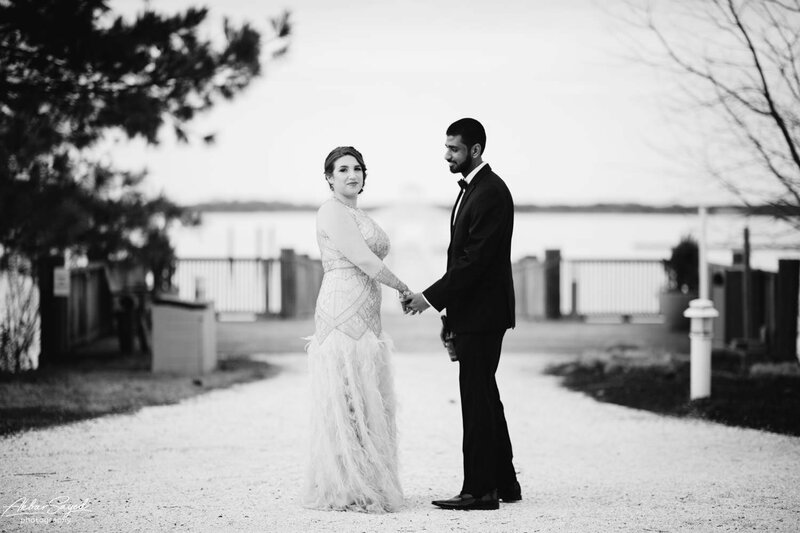 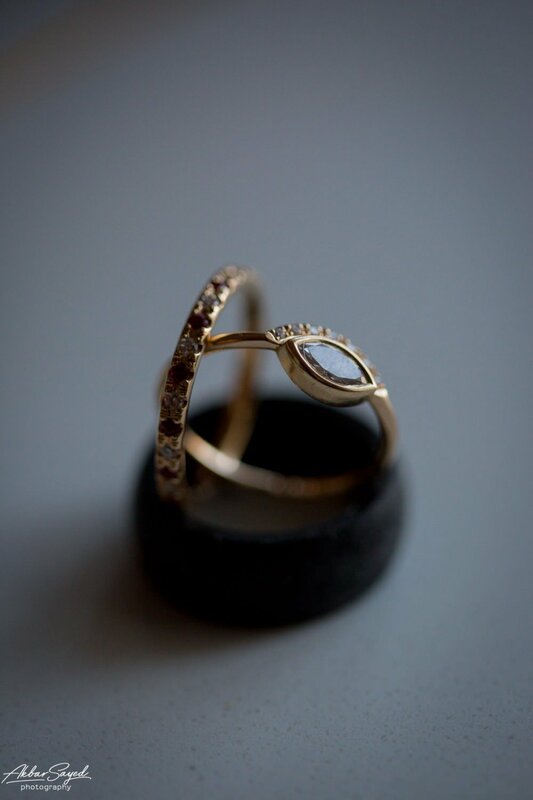 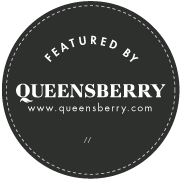 For their rings, Kishan opted for a black silicone band while Cassie’s ring was custom made by Artemer. 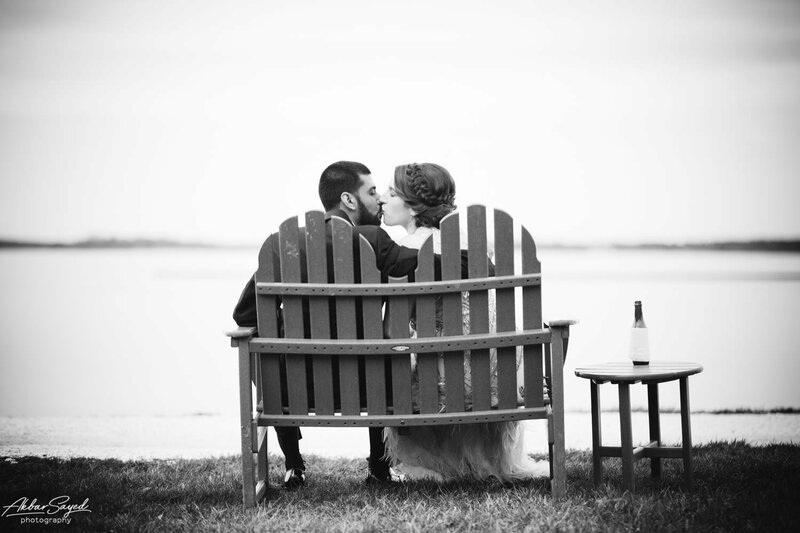 Frigid and windy is the only way to describe the weather. 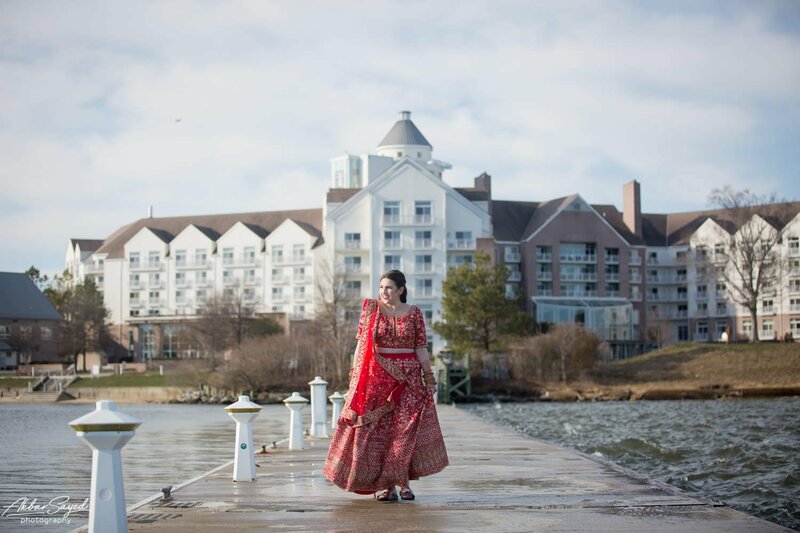 With the hotel being on the water there were gusts of wind that you felt in your bones! 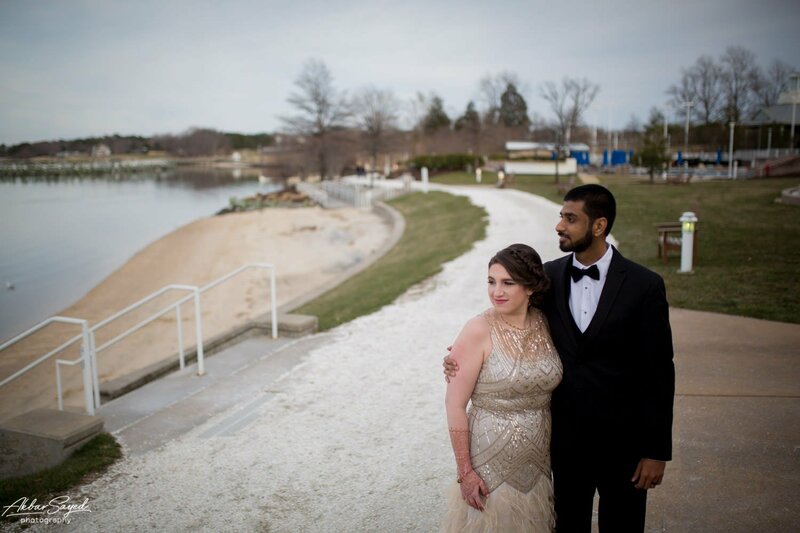 Still, Cassie and Kishan braved the cold (with out jackets!) 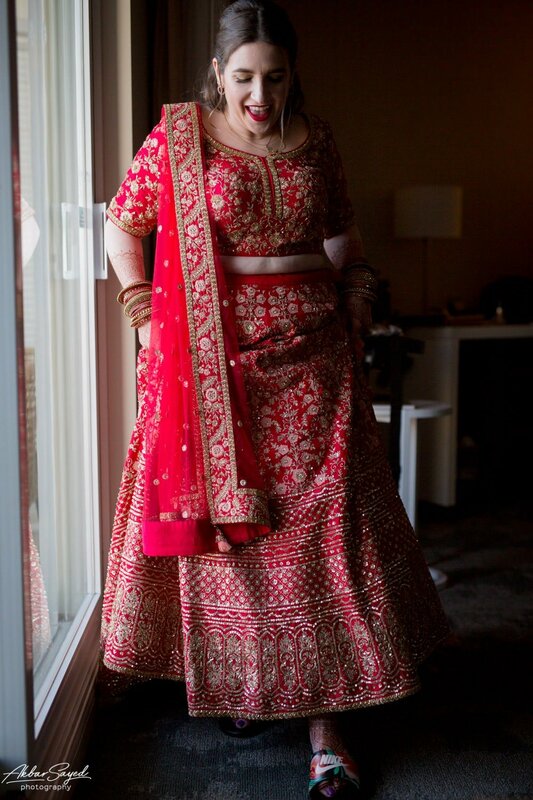 for this beautiful first look. 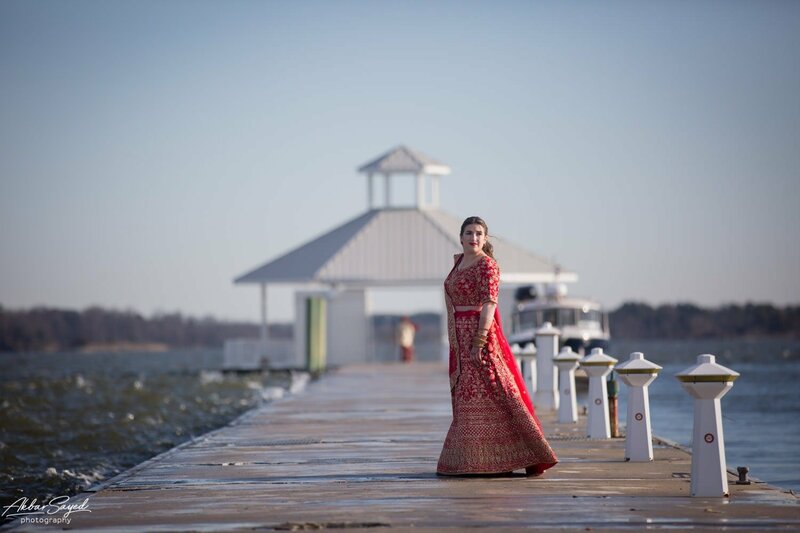 You can see as Cassie walks down the pier that the wind is blowing so hard that the water is crashing into one side of the pier and is calm on the other. 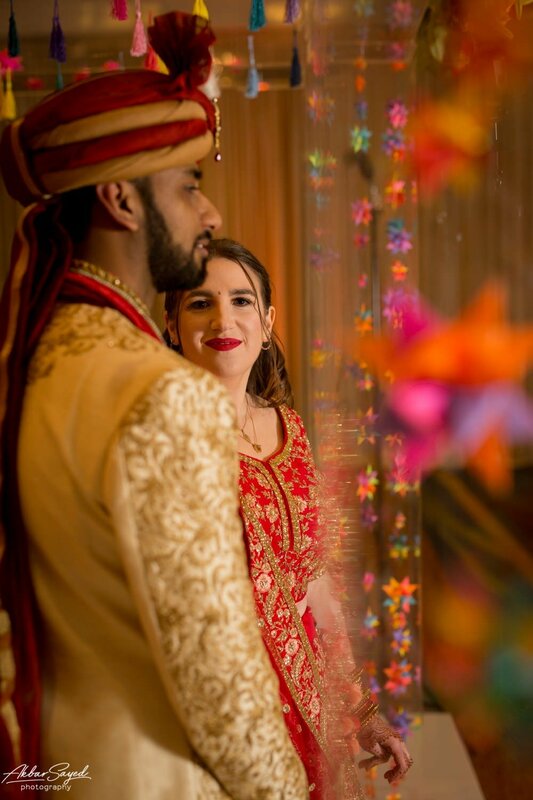 Nadia was set up in front of Kishan to get Cassie’s reaction while I captured Kishan’s. 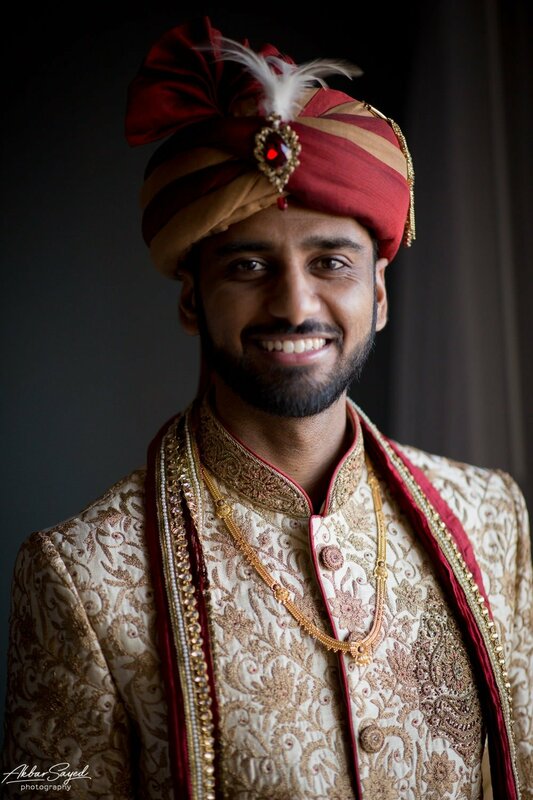 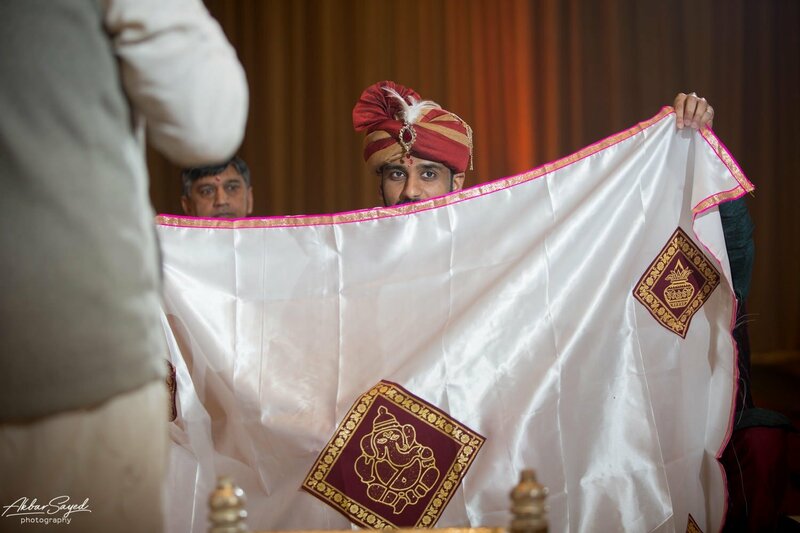 I had a feeling that Kishan may get emotional seeing his bride for the first time and I’m glad I was prepared. 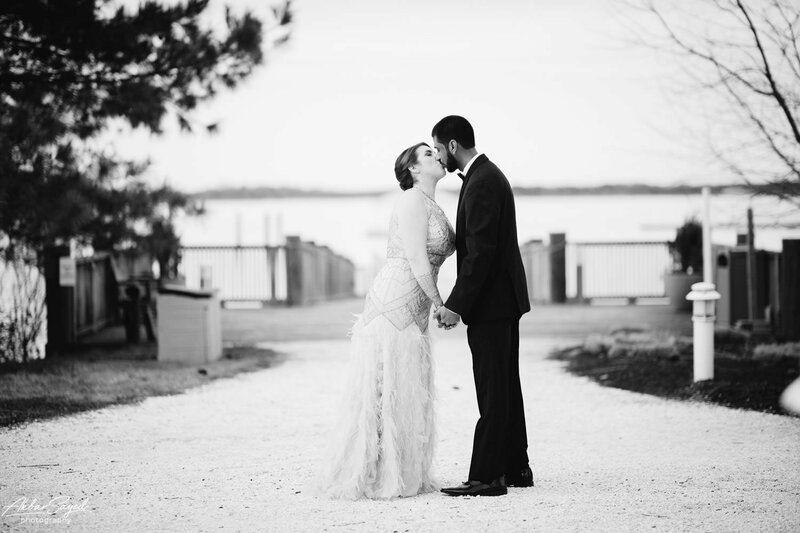 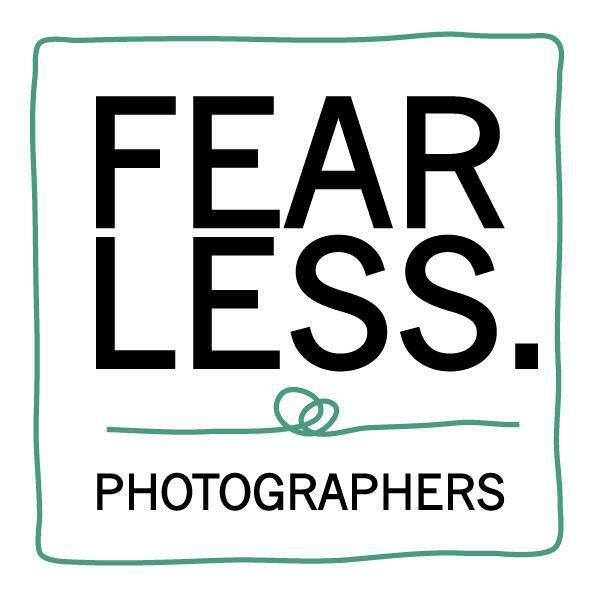 I captured some of my favorite first look photos of all time here! 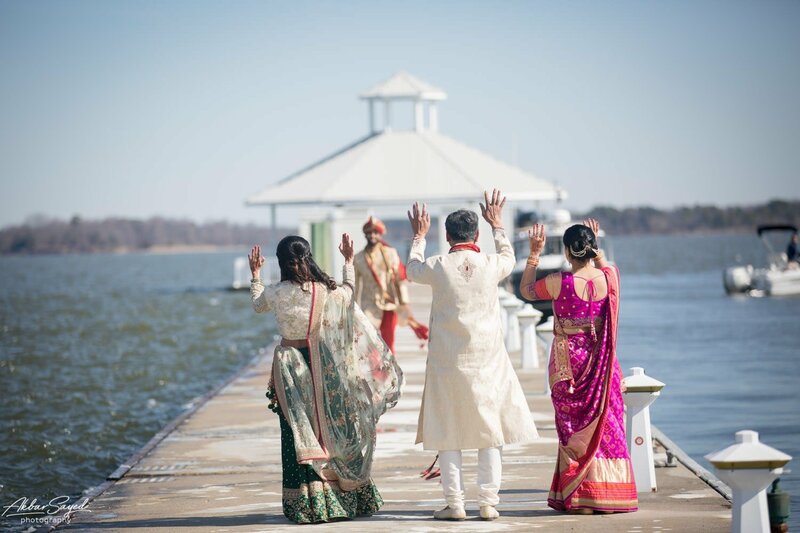 We then ran in side to thaw out and capture some family formals by the custom made mandap by the amazing wedding decorator, L’Ambiance. 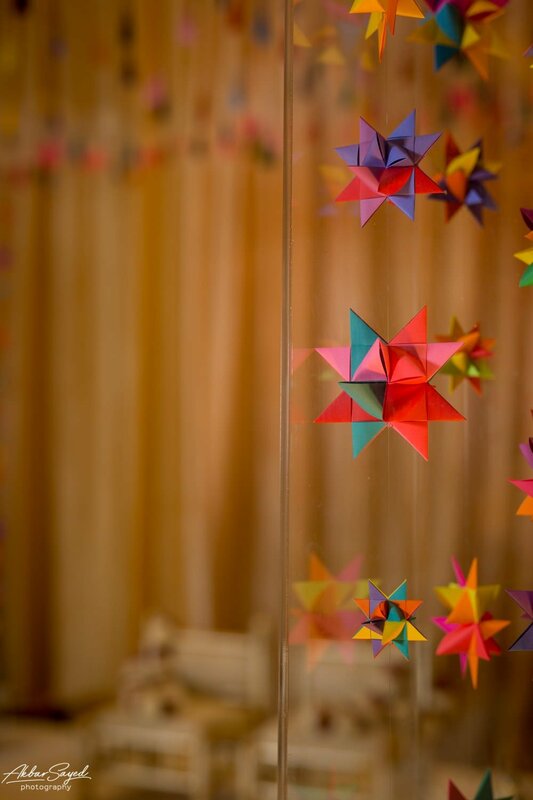 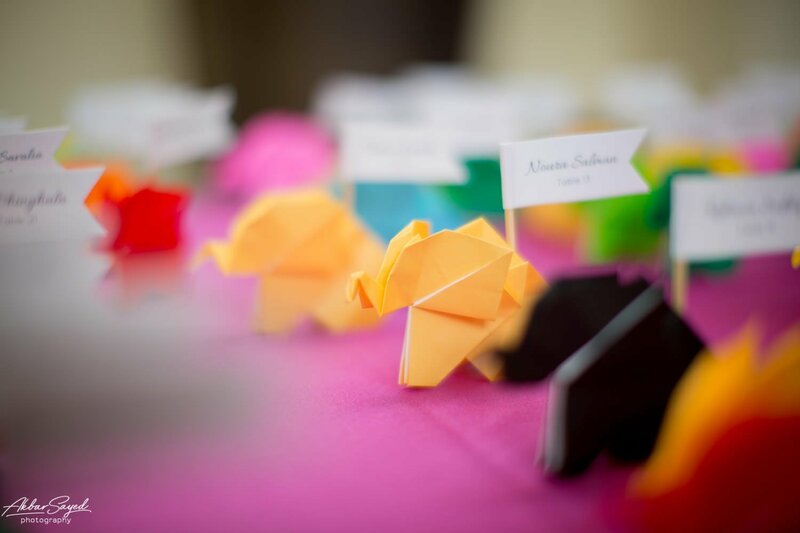 The mandap featured origami made by Cassie her self! 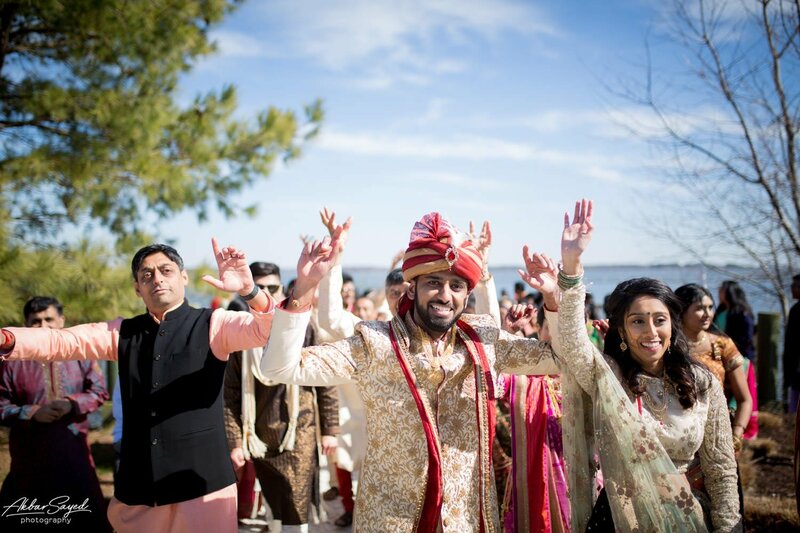 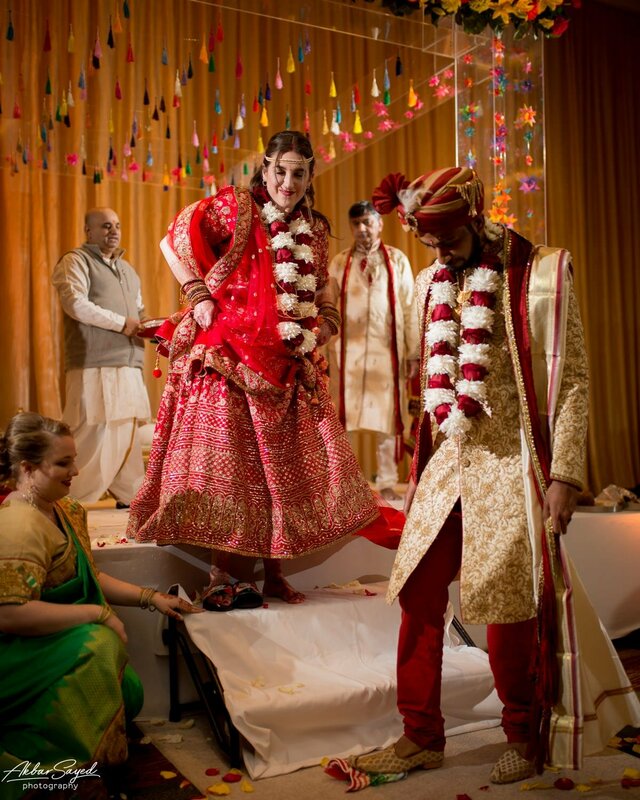 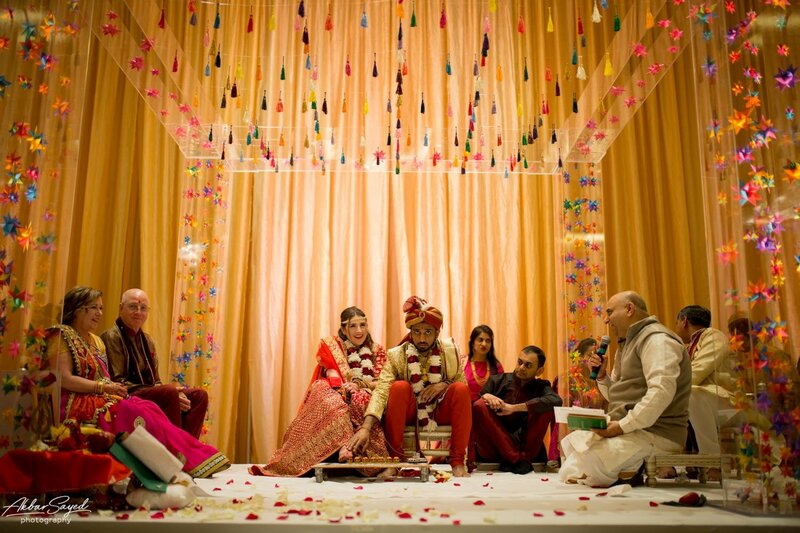 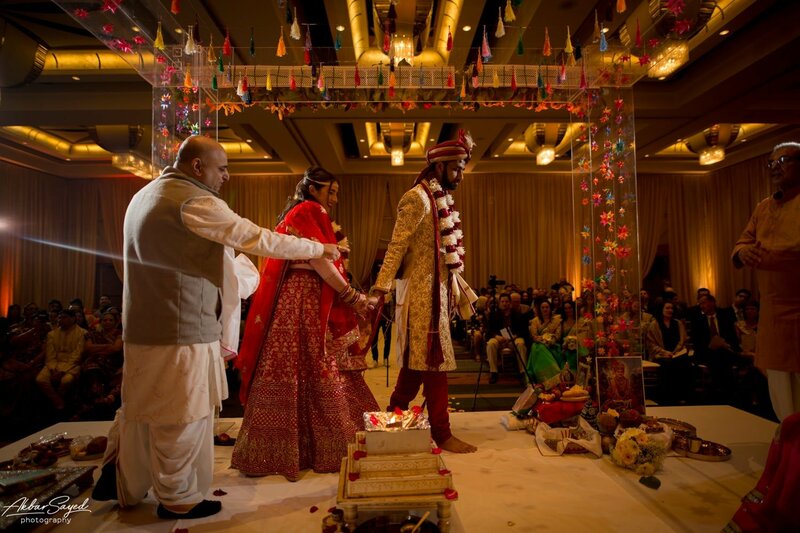 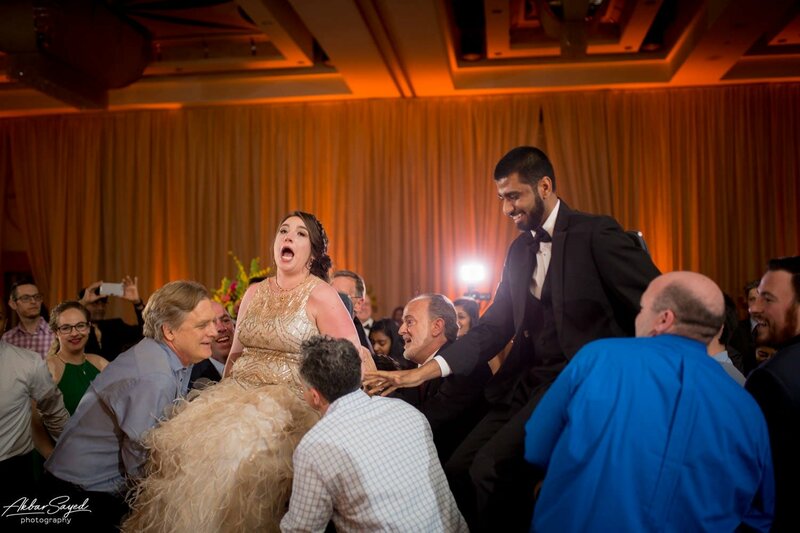 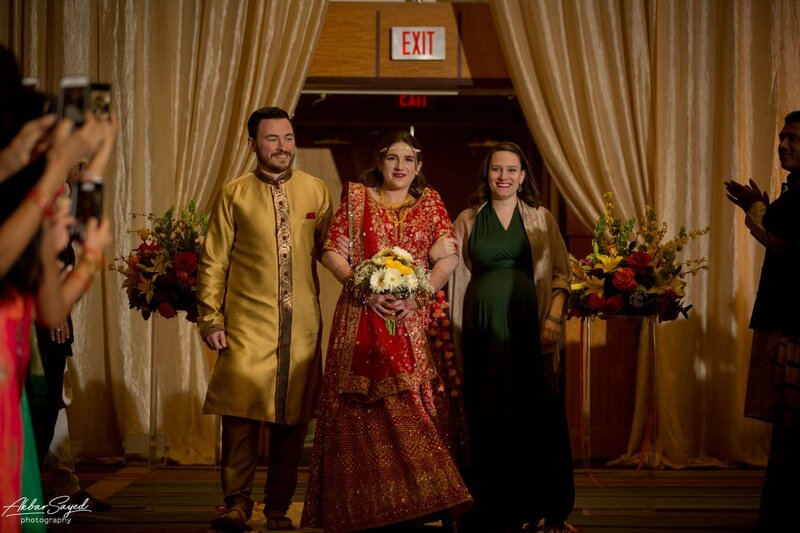 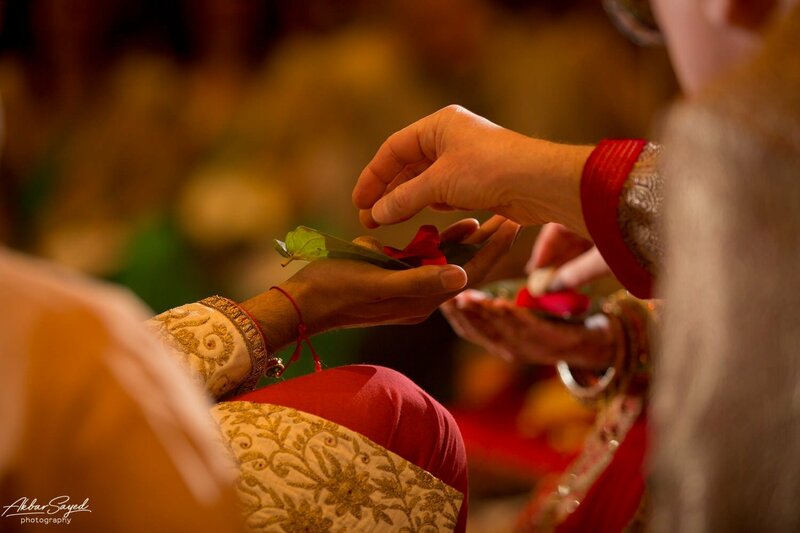 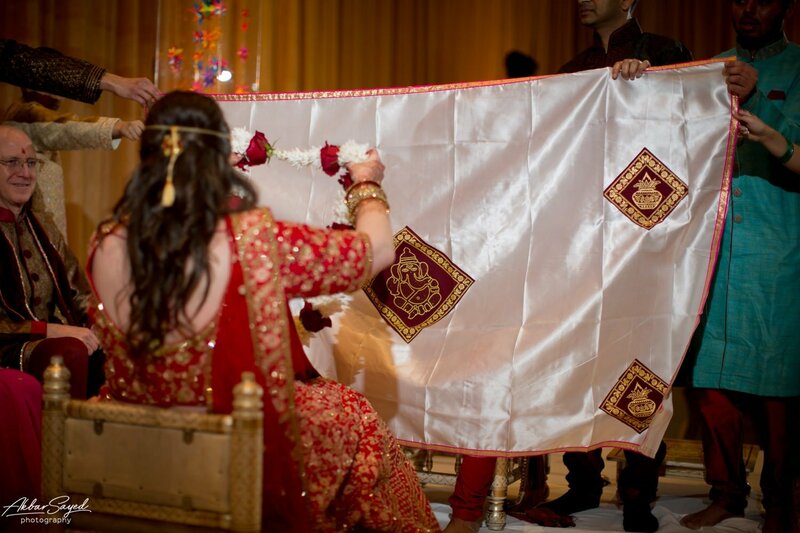 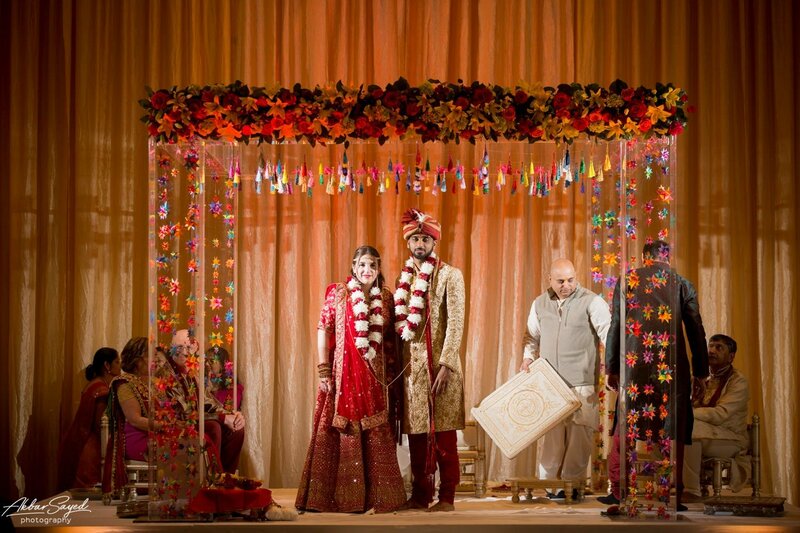 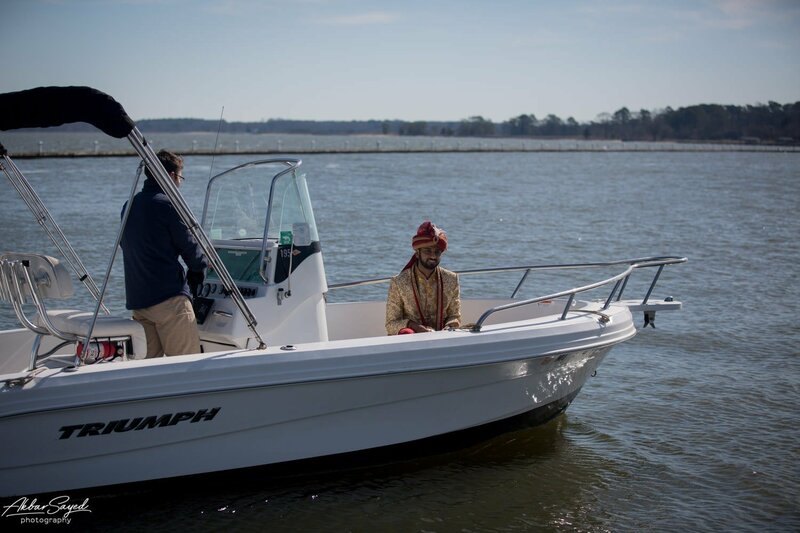 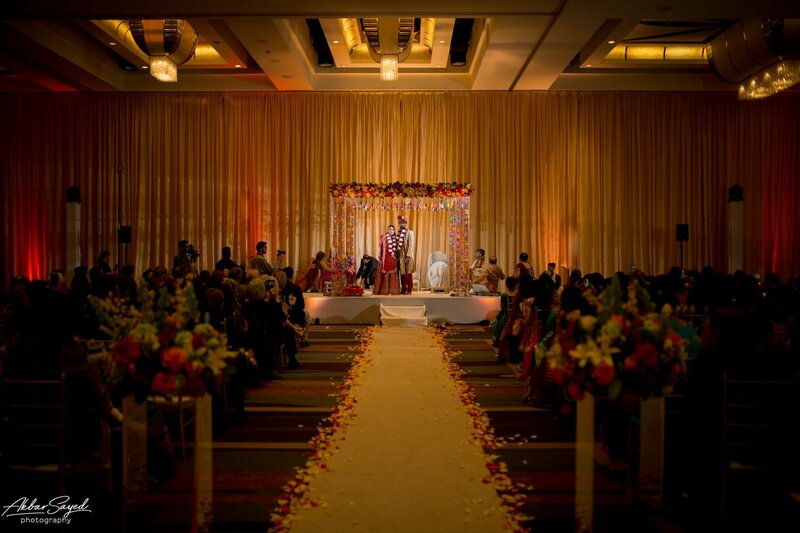 The Fusion wedding ceremony started with a traditional Indian Baraat. 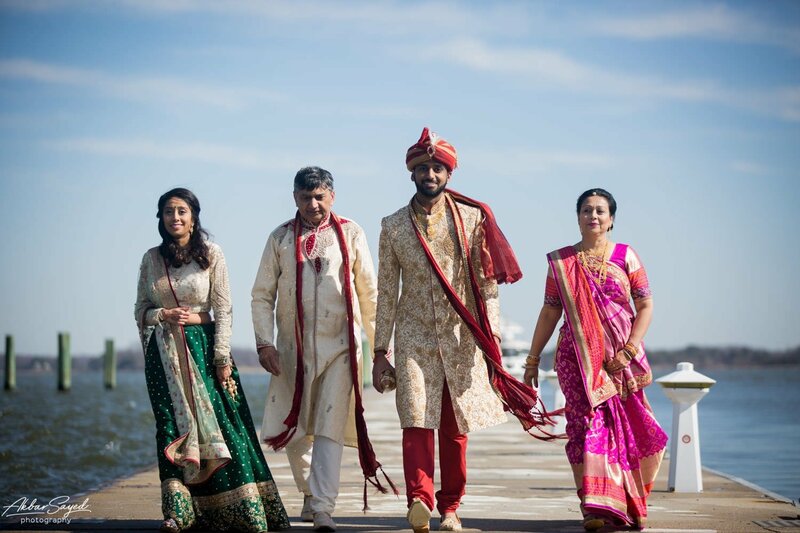 Kishan came in on a boat to the pier and was greeted by his parents and sister and then by all of his friends and family. 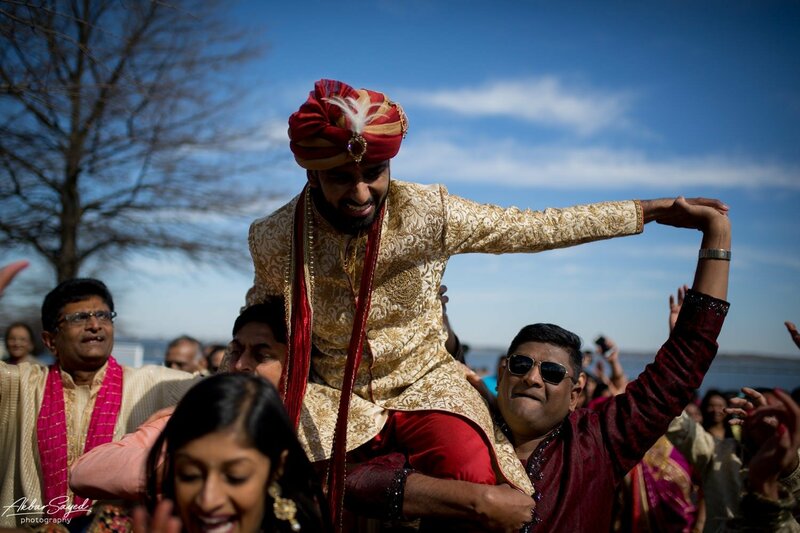 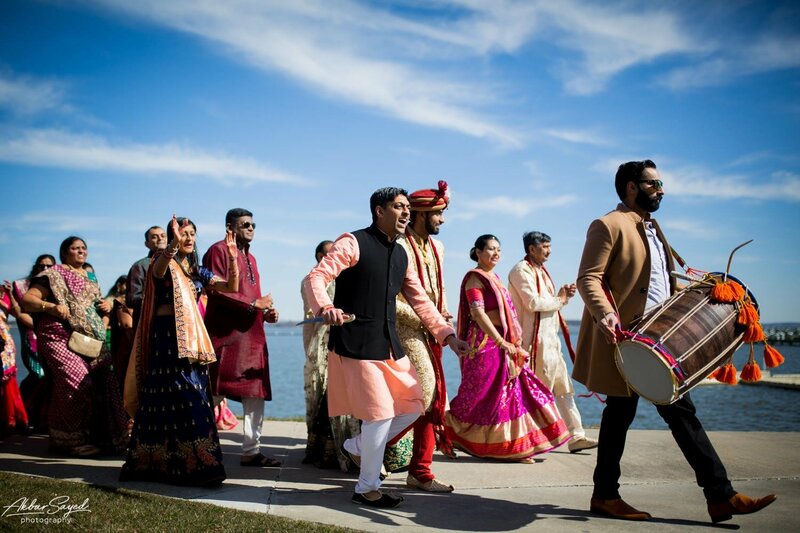 I love the photo of Kishan’s baraat where he is walking side by side with the Doli (Indian drum player). 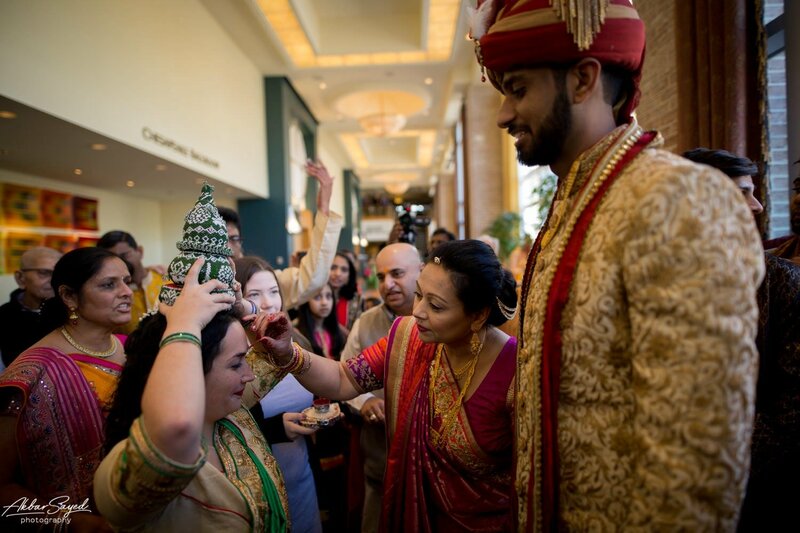 The ceremony continued on with an Arti Puja where Kishan is welcomed from his Baraat by Cassie’s parents and family. 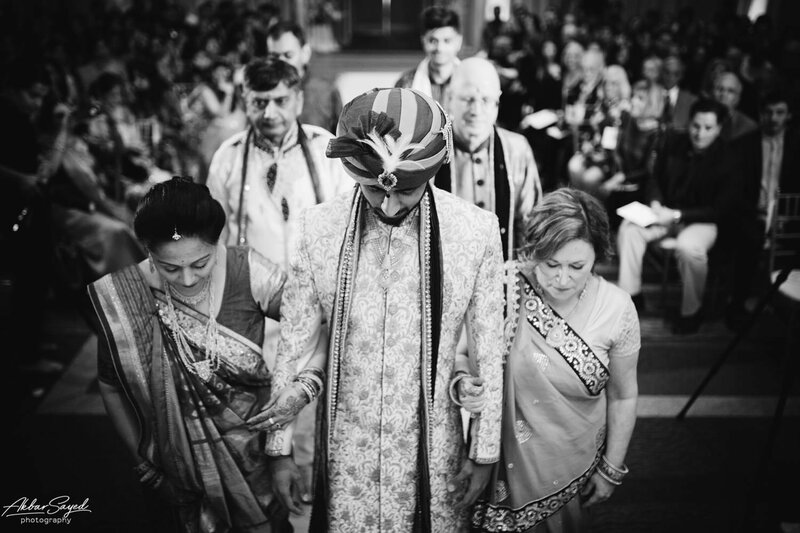 The rest of the ceremony was heavy with Hindu customs as there was a Panditjee who led the ceremony. 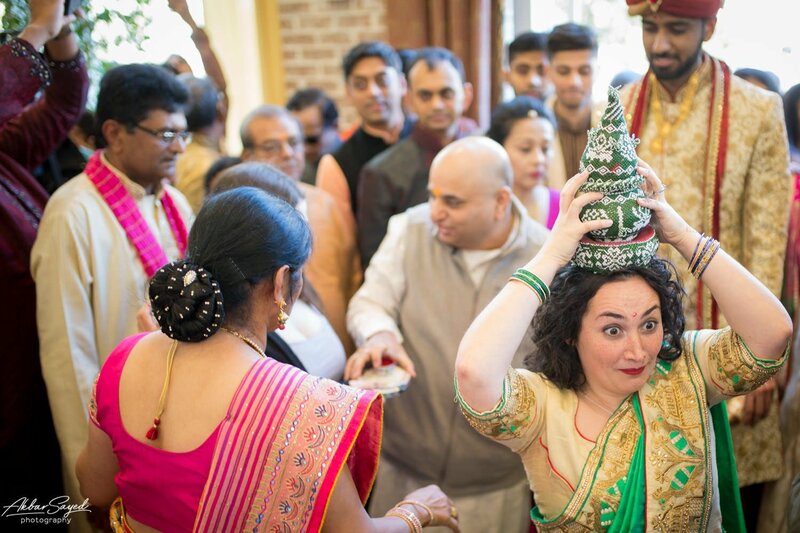 The Jewish element for the ceremony came at the end when Kishan smashed a piece of glass by stepping on it (they wrapped it in a towel for safety). 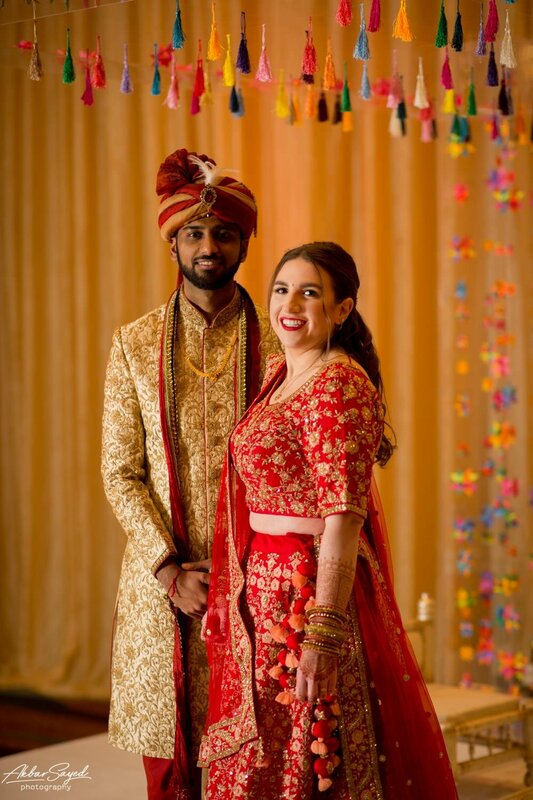 Cassie and Kishan changed attire into their evening wear. 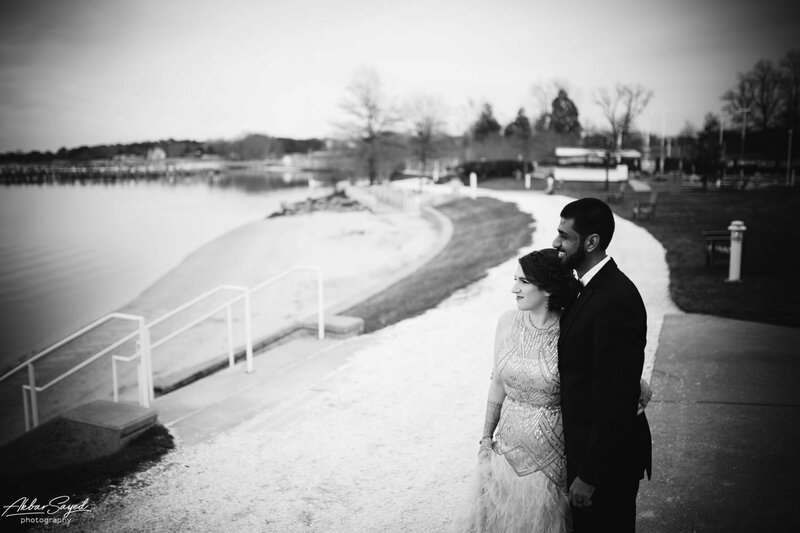 We then took some time for some beautiful portraits by the water. 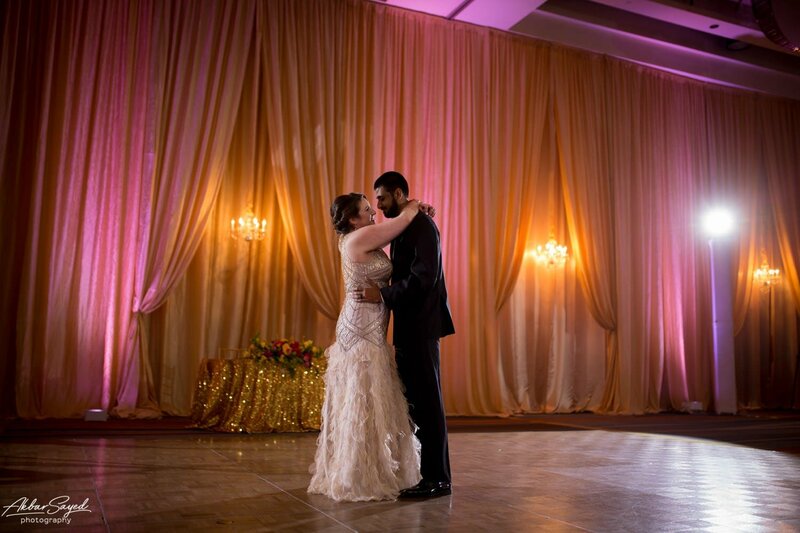 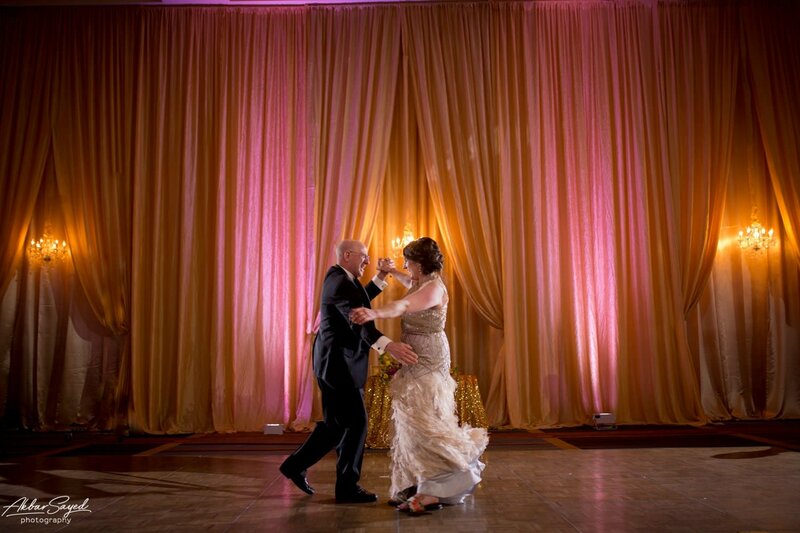 The ballroom was flipped and the dancefloor was put into place and I was able to get a beautiful empty ballroom shot. 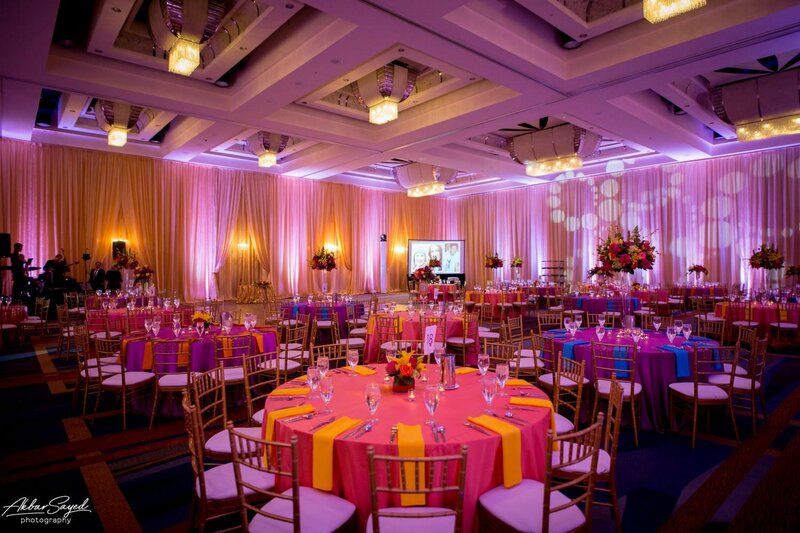 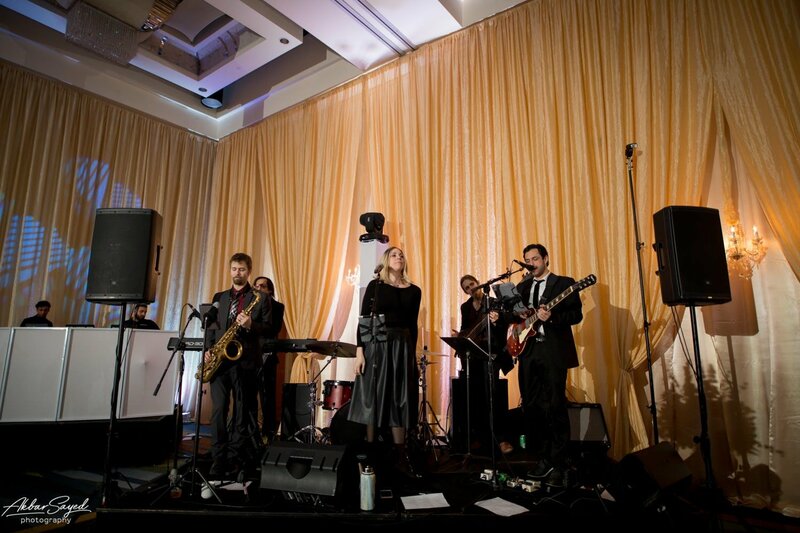 Dynasty DJ’s had provided the uplighting and L’ambiance had draped the entirety of the ballroom. 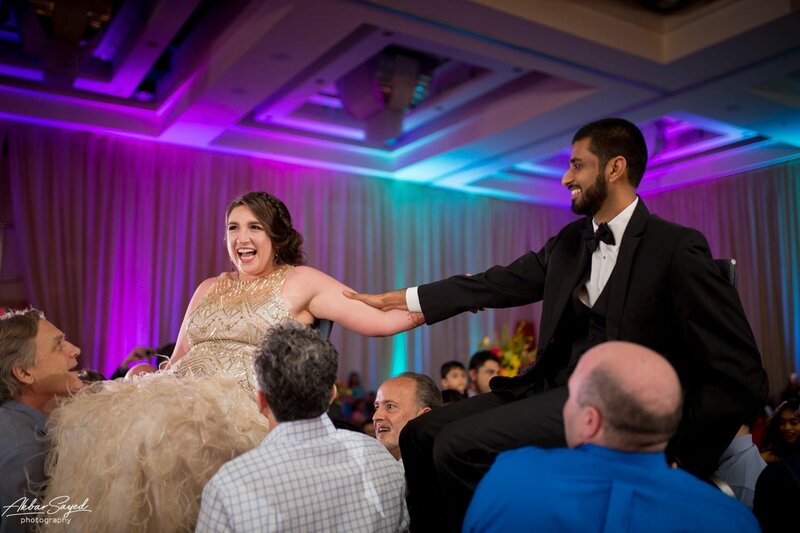 Once Cassie and Kishan made their entrance there were a couple of speeches. 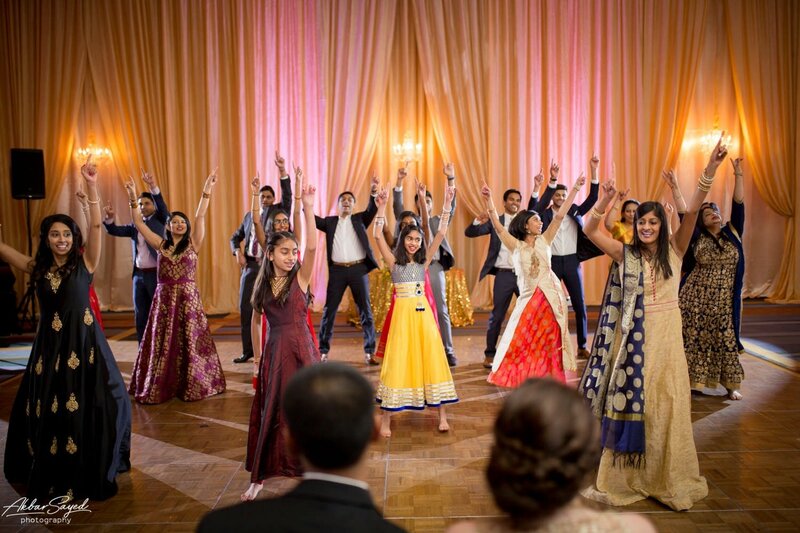 There was then a dance performance by Kishan’s family. 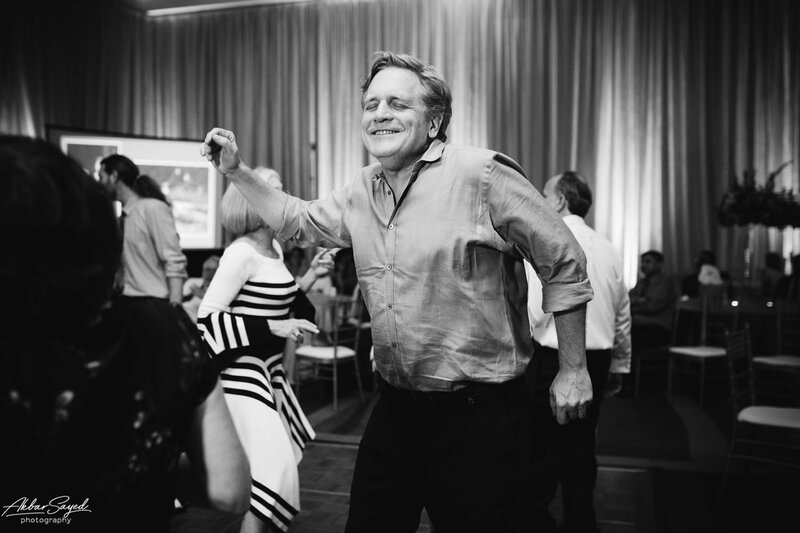 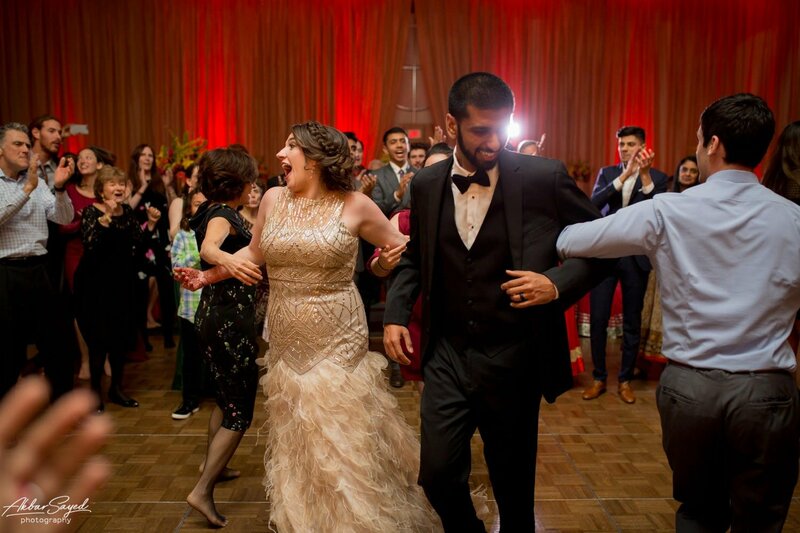 The beautiful evening ended with dinner, the Hora (Jewish Chair Dance), more dancing and a sparkler exit. 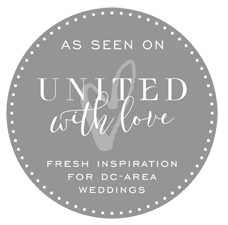 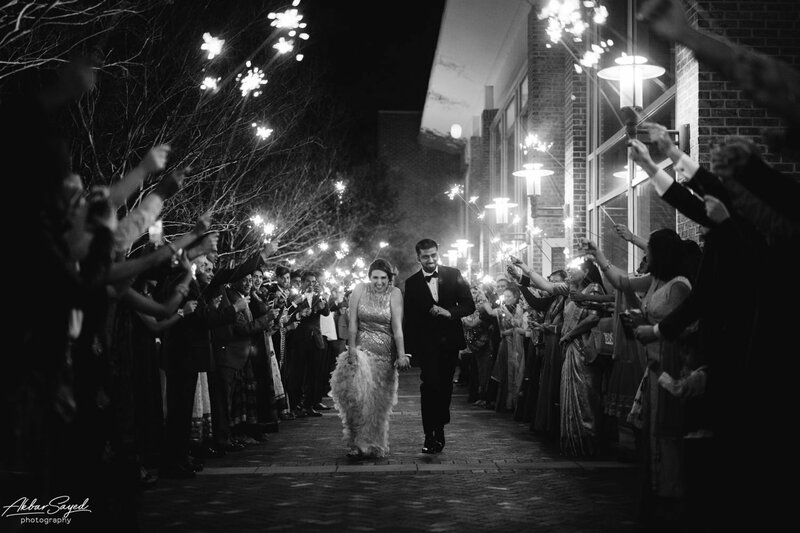 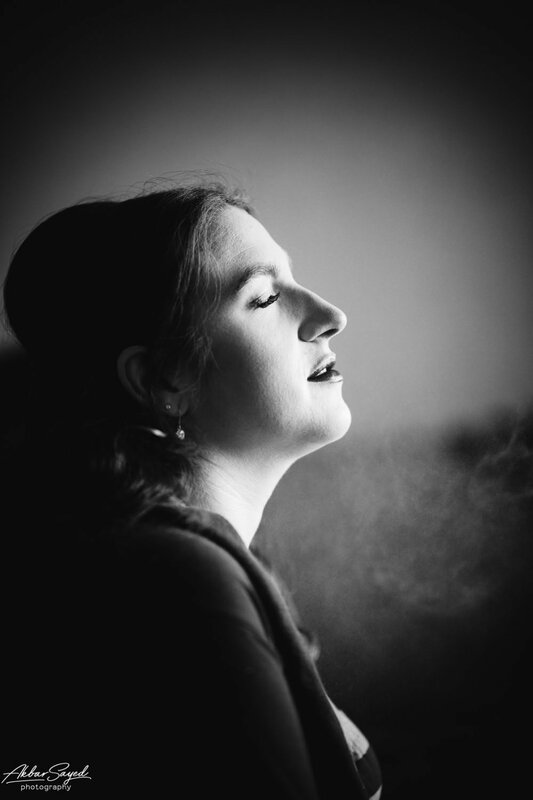 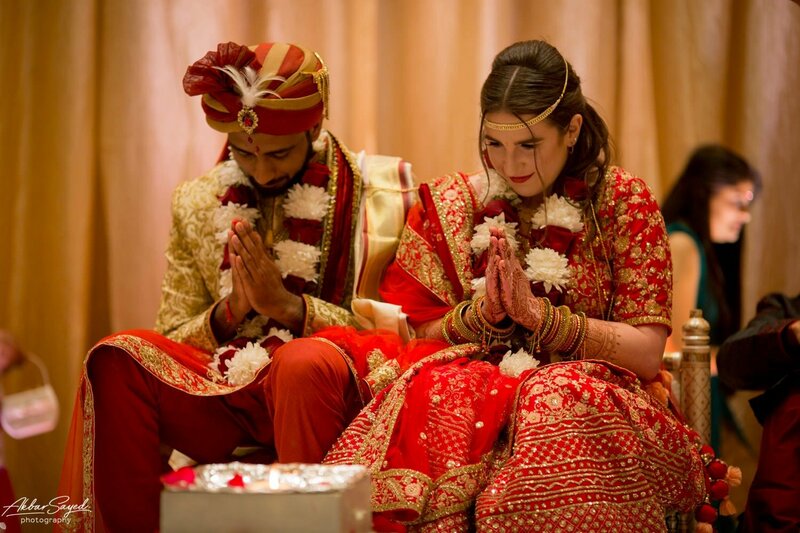 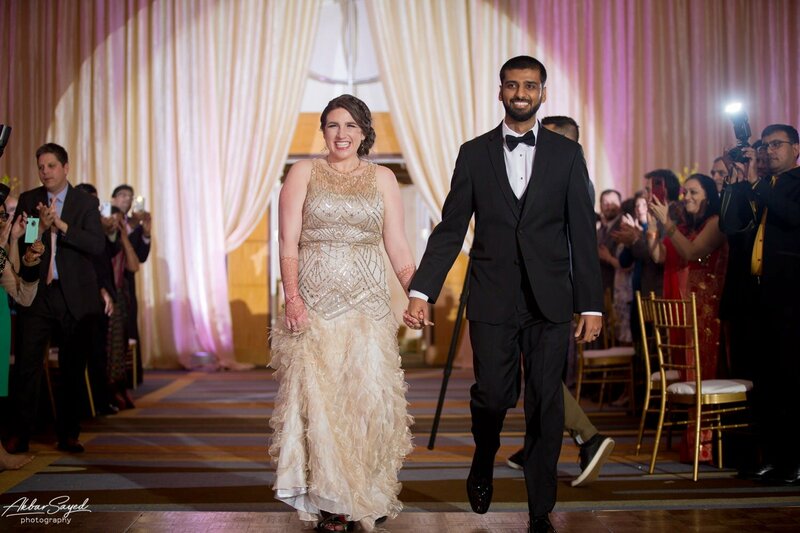 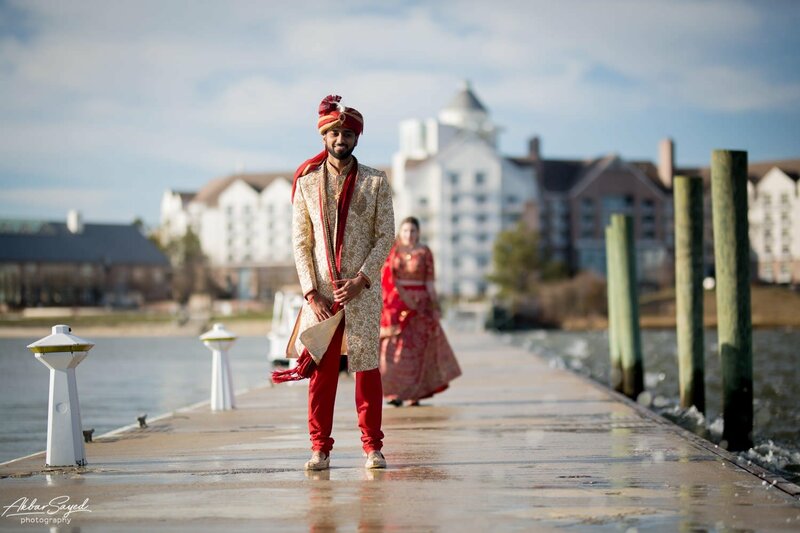 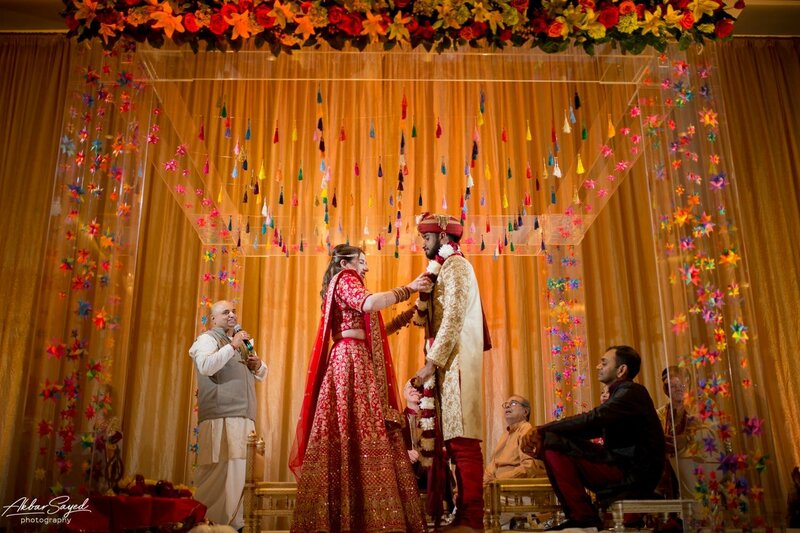 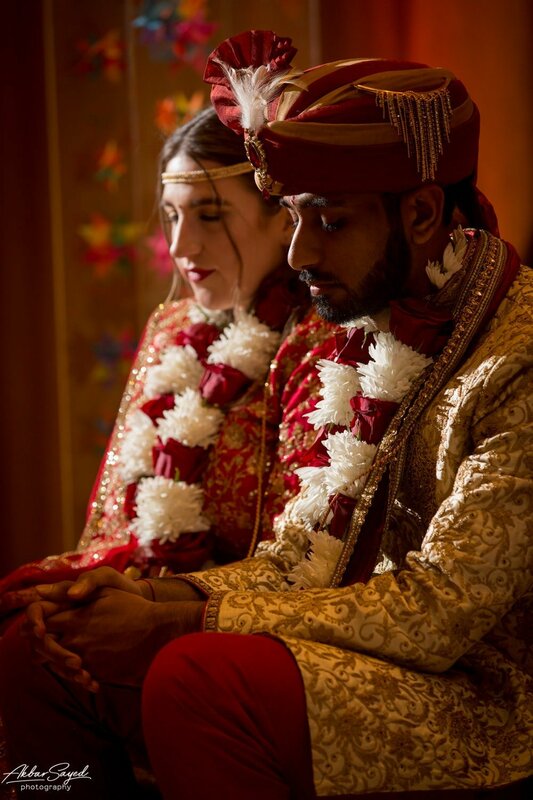 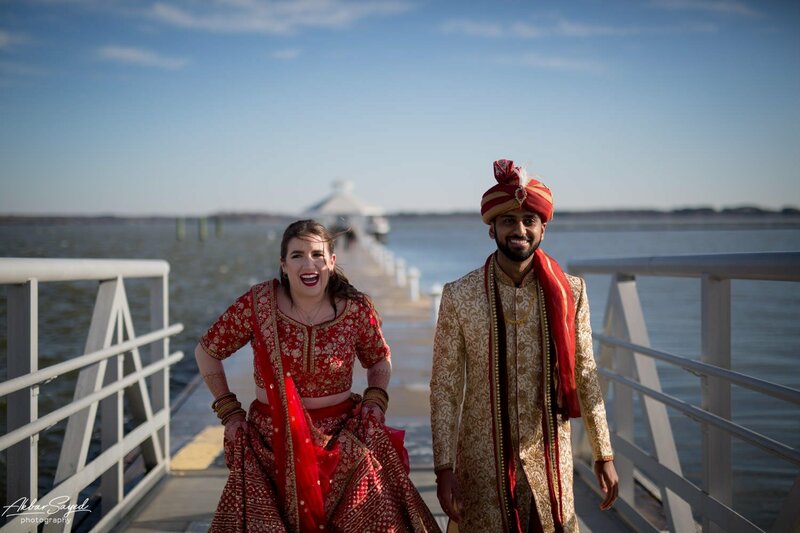 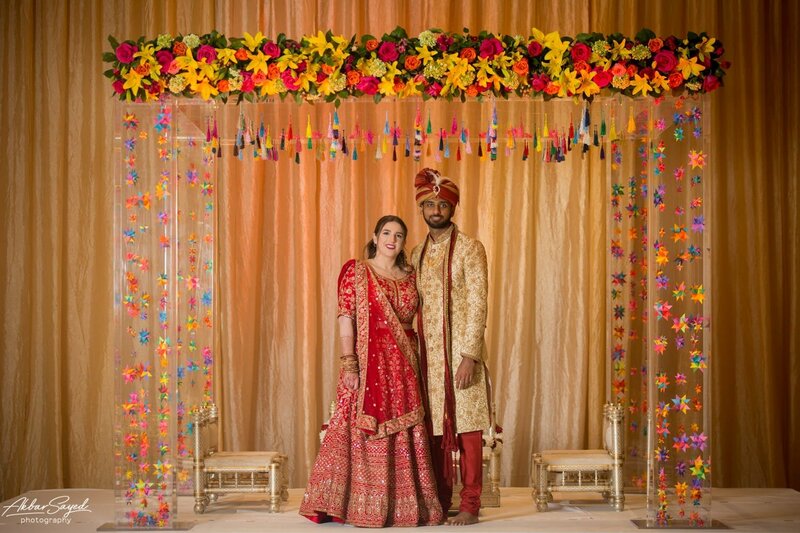 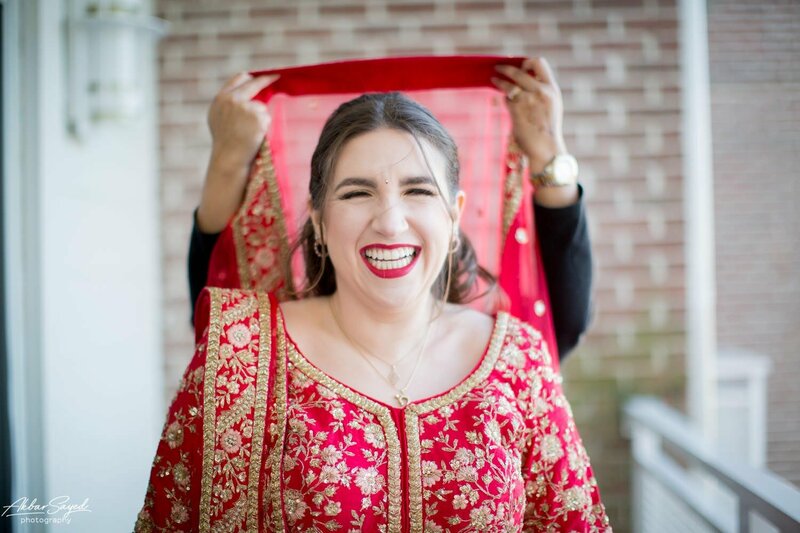 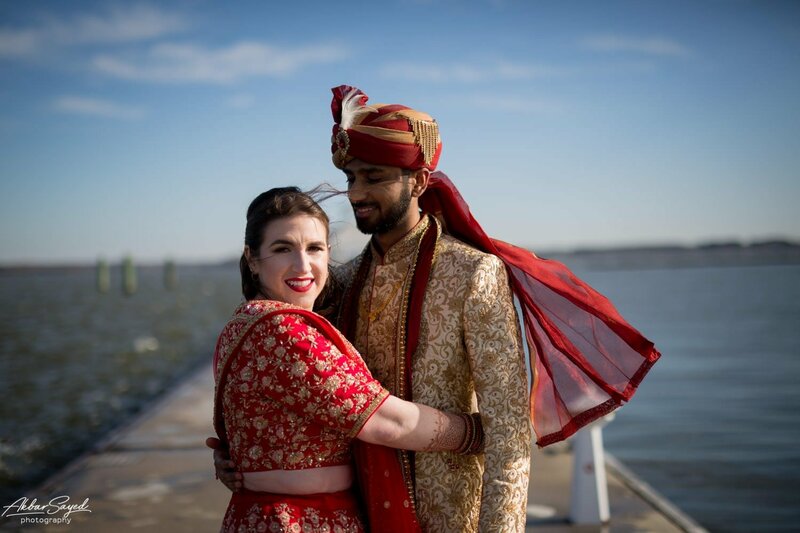 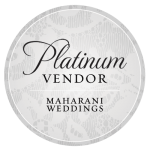 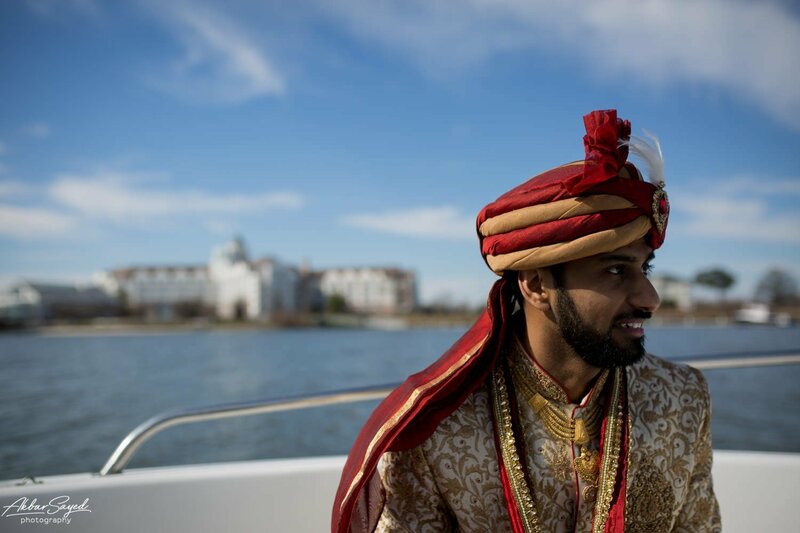 Below you’ll see Cassie and Kishan’s Jewish-Hindu Fusion wedding photos from the Hyatt Chesapeake in Cambridge, Maryland.